3 Kittens Needle Arts offers a variety of project classes to engage and challenge students at all skill levels, from the very beginning to advanced. Our classes are designed to build your skills and inspire your creativity. We want you to get the most out of our classes, so all of our class descriptions include prerequisite skills. For a PDF of all of our Knit, Crochet & Weaving Classes, click here; otherwise, all classes can be looked at on our website - just click on the Classes & Events link above. These 2-hour sessions provide a relaxed, informal atmosphere where you can bring your own project and enjoy the company of others with the guidance of an experienced instructor. 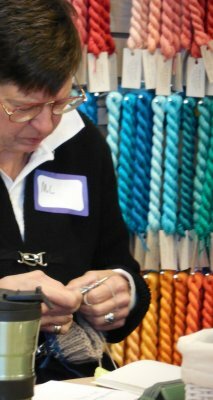 Your instructor can assist you with interpreting a pattern, selecting yarn, or understanding a complicated technique. Knitting - Our 3-session Beginning Knitting Class is where you will learn how to cast on, knit, purl and bind off. You will leave the class with a finished cowl. Crochet - Our 4-session Beginning Crochet Class will teach you how to single crochet, double crochet and half-double crochet. You will make a braided cowl. Weaving - Our 2-session Intro to Weaving class will get you started weaving on a rigid-heddle loom. Students will make a scarf. Level 2 classes are for those students who have completed the Level 1 beginning classes or have the skills listed below. They are designed to reinforce the skills learned in Level 1 and introduce the next range of skills that are essential to becoming well-versed in your craft. What skills should you have before taking on a Level 2 Class? Level 2 classes are for those students have done a few projects and are excited to learn new things. This intermediary level is designed to slightly challenge the new knitter with skills and techniques that are important to make the student a true "knitter" or "crocheter". There aren't necessarily any specific requirements beyond what we list for Level 2, except that it is important that students in these classes have completed a few projects and feel confident in their knitting. Level 3 classes are designed for students who are feeling comfortable with the all aspects of Level 1 and Level 2 and are ready to explore new techniques and more complicated patterns. Level 4 classes are appropriate for students who have become very comfortable with Level 1-3 techniques and have an adventurous spirit when it comes to their craft. We can take your registration online, in person, or over the phone. All you need to do to secure your spot in a knitting or a crochet class is to pay the class fee and purchase any required materials. Each class has a maximum of 6 students unless otherwise specified, except for Tool Box classes which can generally have 10 students. Classes are filled on a first-come, first-served basis. Once you are registered, we will provide you with a Class Information Sheet that lists all the class materials you will need as well as any class preparation instructions. The specified materials must be used for the project and purchased at 3 Kittens Needle Arts. Allow at least 2 weeks for any special orders of yarn or other supplies for knitting or crochet classes. 3 Kittens Needle Arts reserves the right to cancel or reschedule a class due to weather or instructor illness. If the class is cancelled by 3 Kittens, class fees will be fully refunded in the form of original payment. For knitting and crochet project classes, student cancellations must be made at least two weeks prior to the first session to receive a refund for the class fee. For studios, student cancellations must be made at least 3 days prior to the studio. After that date, class fees are not refundable and cannot be transferred to another class. Any yarn or supplies purchased for the class are subject to our regular return policy.